Get on up, it's Zatkoff Time! 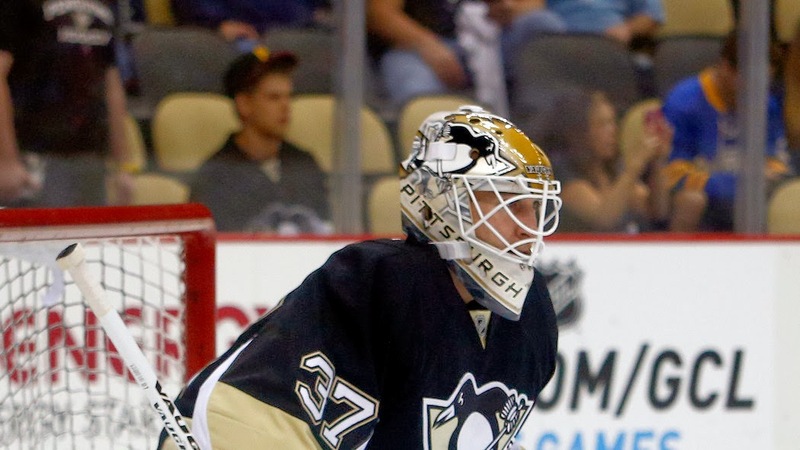 It was late before the season began when we learned that Tomas Vokoun was in trouble. We had seen him get out of tough situations before, holding strong in front of perilous offensive attacks, and keeping our boys in games when things looked their bleakest. This time it was different. The enemy was not wearing an opposing sweater, it was much more serious than that. Vokoun was back at battle with a familiar foe. The same blood clot issue that had caused him to miss a significant amount of time back in 2006 was wreaking havoc yet again. All of the sudden our rock solid number two, that had turned into a solid number one goaltender in the wake of a second playoff fall-from-grace of Marc-Andre Fleury, was gone for what could have been not only the season, but possibly his career. This meant that our goalie situation was about to change dramatically. Our number two as it turned out became Jeff Zatkoff, the 26 year old American goaltender from The Motor City. After a maniacal start to the season for Fleury, Zatkoff came in for a road game in Sunrise, Florida against a seemingly weakened Panthers squad. a squad that nonetheless plays the Pens hard every outing that I can remember. The Panthers quickly jumped on Jeff in his first romp in net, and routed him for 6 goals on 30 shots. It was then that the you-know-what hit the proverbial fan back in Pittsburgh where Penguins faithful started to jump from the bridges and made their "Be a GM" credentials known by calling for trades, and hoping that Ray Shero would pick up some down-and-out backup from the sewers of Free Agency. Ray Shero decided instead to keep riding Fleury, and hold on to hope that Jeff Zatkoff would rebound and give the team the big backup starts we needed for continued success. Then we played Columbus. A home-and-home match up between two new division rivals bound by proximity. We walloped them at home with Flower in net, and then sent in who else but Jeff Zatkoff to finish off the affair across the border in Ohio. Finish it off he did, and in stunning fashion, turning away 19 of 19 Blue Jackets shots to post his first career shutout. Things were looking better in Pittsburgh. All of the sudden the weakest link in our lineup looked a heck of a lot more promising than it did before. Now however, we come out of a stretch of games in which Fleury did not need any rest. The games were spaced out enough (7 games in 19 days) to allow him to make all the starts he needed to. There were games where he looked phenomenal and ones where he looked more than a little human. Now comes the big test for Zatkoff. the D-Corps of the Penguins is firing on almost all cylinders, and playing well, our stars are out and shining (for the most part) and if he is going to prove to the people of Pittsburgh that he IS indeed our backup goalie we can count on, he HAS to do it now, starting tonight. Tonight is not the end all game that will tell us how Zatkoff will play out his days here in the Steel City, but it is the beginning of a crucial stretch of games, some of which will feature him in net, that will give us an idea of just where he is in the grand scheme of things. Tonight is as good a night as any for a young goaltender to go out and make a statement. Zatkoff needs to show us that the Columbus game was not a fluke, and that we can trust in him to come in and hold down the fort without selling away the farm. There are always moments in a young players career that shape how things roll from there on out. I believe that tonight could be a very big night for Jeff Zatkoff. With a city at his back, on a night where the crowd will be loud, and the city will be lit up like a Christmas tree, It's time for Jeff Zatkoff to steal the show against the same team that stole a win from him earlier this season. Doing so might just allow Marc-Andre Fleury to breathe a sigh of relief, knowing that the weight of the hockey season now has another shoulder to rest on. That is, if things go according to plan.